In a PERFECT world where everyone DESTROYS everything and eats HUMAN FLESH, one ZOMBIE has had enough: BUCK BURGER. When he rebels at the natural DISORDER, his marriage starts DETERIORATING and a doctor prescribes him an ANTI-DEPRESSANT. Buck meets a beautiful GREEN-HAIRED pharmacist fairy named FAIRY_26 and quickly becomes a pawn in a COLD WAR between zombies and SUPERNATURAL CREATURES. 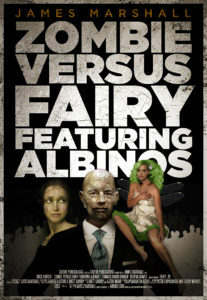 As Fairy_26 flies him between her tree-branch apartment in FAIRYLAND and an aircraft-carrier PIRATE SHIP in a zombie-infested DYSTOPIA, Buck Burger struggles to make sense of it all and remain FAITHFUL to his OVERBEARING wife. Does sixteen-year-old SPIRITUAL LEADER and pirate GUY BOY MAN make an appearance? Of course! Are there MIND-CONTROLLING ALBINOS? Obviously! Is there hot ZOMBIE-ON-FAIRY action? Maybe! WHY AREN’T YOU READING THIS YET?